For chorizo mixture, add chorizo to a skillet over medium heat with a small drizzle of olive oil. Cook until chorizo is browned well. 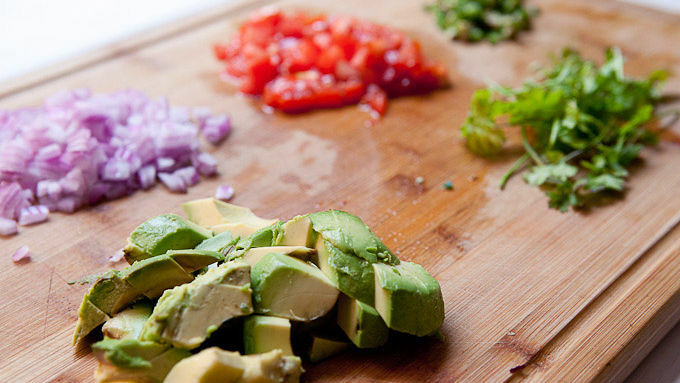 As it cooks, use a wooden spoon to break it into small chunks. 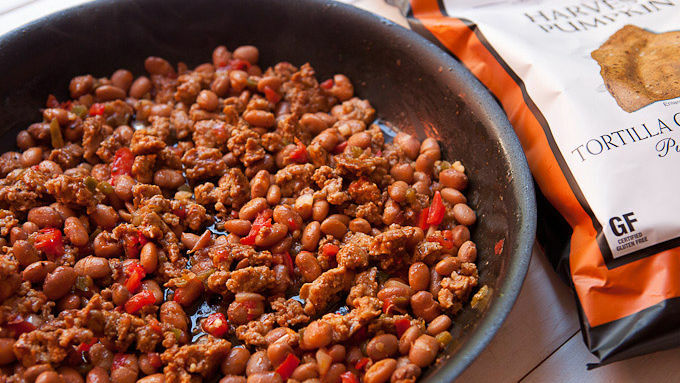 When the chorizo is cooked, add drained beans and salsa and stir to combine. Season with a pinch of salt and pepper and keep warm over low heat. 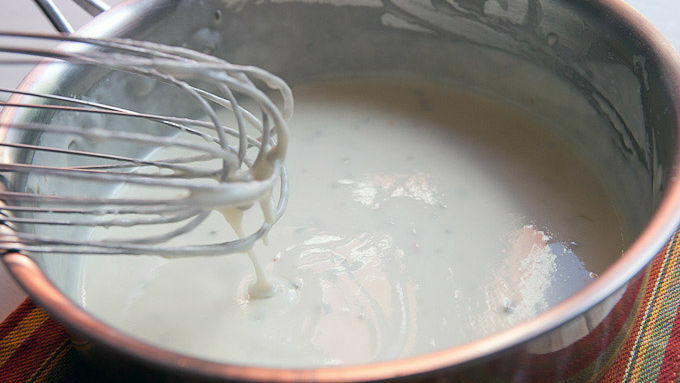 For cheese sauce, melt butter in a small saucepan. Whisk in the flour and cook over medium heat for 2 minutes or until the mixture turns a light brown color. Then slowly whisk in milk until the mixture is thick. Add grated cheese and stir until melted and season with salt and pepper. To make nachos, spread chips over a large serving platter. Top with half of the chorizo mixture, followed by half of the cheese sauce. Then add the rest of the chorizo mixture and the last of the cheese sauce. Top with any fresh vegetable toppings you want. Serve while warm, but the cheese sauce will stay liquid even once it cools. Your fall get-together deserves pumpkin chip nachos and loads of flavorful, cheesy toppings. 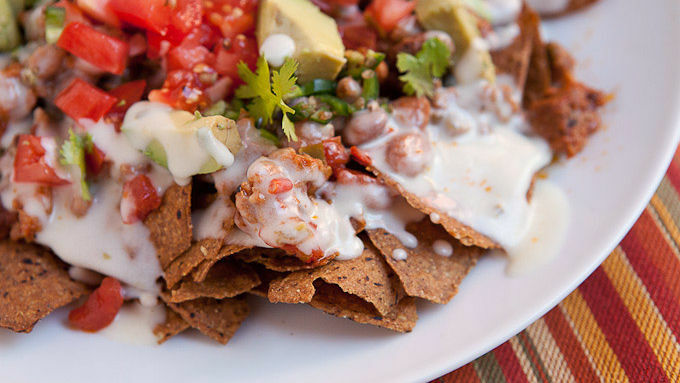 Most people are happy to mess around with nachos, trying different flavors and variations – but with one big exception. Most people don’t mess with the base. Corn tortillas are always the standard. But that’s kind of silly if you think about it. There’s no reason not to try out other fun chip options, especially if you have some great chips to try – like the new seasonal Food Should Taste Good™ Harvest Pumpkin chips. These are really flavorful tortilla chips, and sturdy enough to top high with great nacho flavors. The pumpkin flavor is subtle, but goes perfectly with the other flavors in this recipe. And since it's a seasonal flavor, you can substitute their sweet potato chips if you want to during other times of the year. 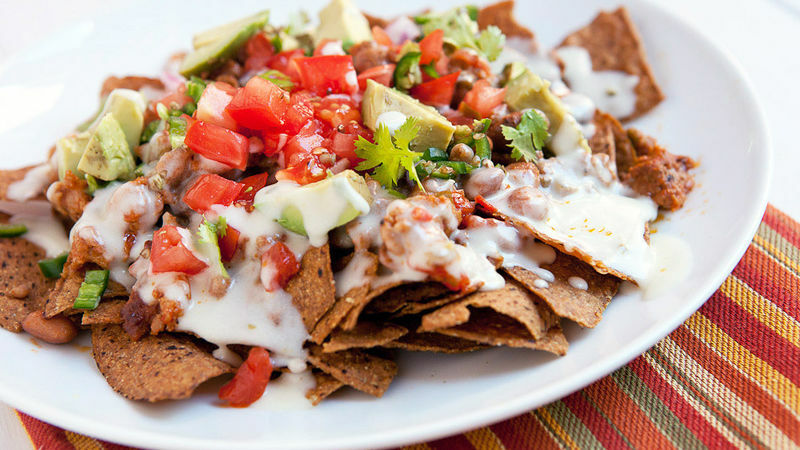 Part of the fun of nachos is topping them with whatever you want. I kept my toppings pretty straightforward for these since I had a lot of other flavors going on. Spread out the chips on a serving dish and top with the chorizo mixture, cheese sauce, and any other toppings you want. CHOW DOWN.